Fabric Vertical Blinds in pattern Orbit is our best selling vertical blinds fabric. 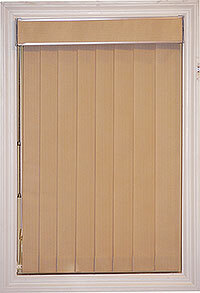 Available in 4 different colors and, can be custom fitted to a wide range of window sizes. Made from a stitch bonded polyester fabric these blinds gently filter the light while maintaining privacy at the window. These fabric Vertical Blinds have a soft vertical pattern and you will love the way they complete the look of any window in your home or office. Each vertical louver has a sewn in weight at the bottom for stability and, an optional 3 1/2 inch matching dust cover valance is available. All mounting hardware is included with your purchase.